What Are the Predators of the Giant Panda? The giant panda is a species of bear that lives in Asia. Panda bears are famous for their black and white bodies, which include black eyes and ears with a white face. 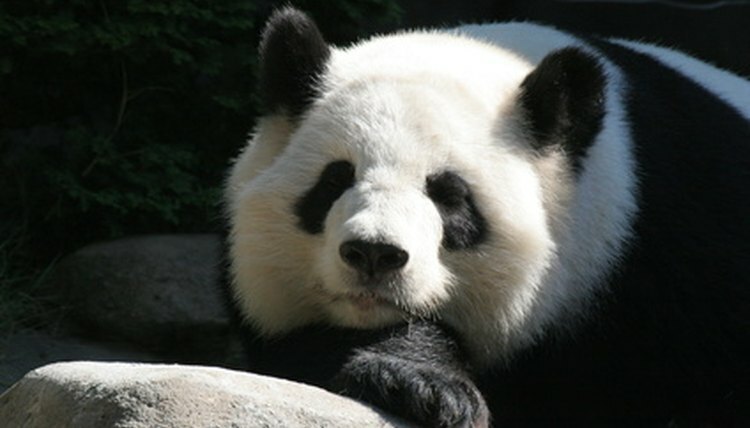 The giant panda feeds on bamboo, which is also indigenous to Asia, and typically births one to two cubs per pregnancy. Pandas are an endangered species due to the natural and contrived predators that hunt and kill these serene giants. One of the main predators of the giant panda is people. Poachers have decreased the animal's numbers, selling paws and fur on the black market world wide. Since pandas only nurture one cub per pregnancy, increasing their population has become hard and steady work for zoologists everywhere. The encroachment of land by builders and loggers has also lowered panda numbers. As the rain forests and grasslands disappear, so does the panda's only food--bamboo plants. Leopards are found in many regions of the world, including the rain forest and grass lands of Asia. Leopards will hunt mainly average size prey, such as gazelles, but are known to track down panda cubs. The snow leopard of Asia, which interacts with the giant panda, is also an endangered species. Wild and domesticated dogs alike will attack panda cubs. Wild dogs may come upon a mother and her cubs, and since the mother only cares for one cub, a second cub may fall victim to the dogs. The mother panda may not fight off the pack if it is too large, thus possibly losing both cubs. Likewise, when farmers encroach upon the natural habitat of the giant panda, their domesticated dogs might attack a panda or cub in a statement of territorial dominance.